For the past decade, the VibraVM has improved the quality of life for animals with respiratory conditions throughout the world. Could your horse benefit from improved lung function? For horses suffering from COPD, ROA, or EIPH, the VibraVM makes good sense as part of an overall management strategy. The VibraVM is a physiotherapy device for respiratory conditions. The VibraVM is a patented drug-free method for clearing lung passages and relaxing the long, smooth muscles of the airways that can become restricted. 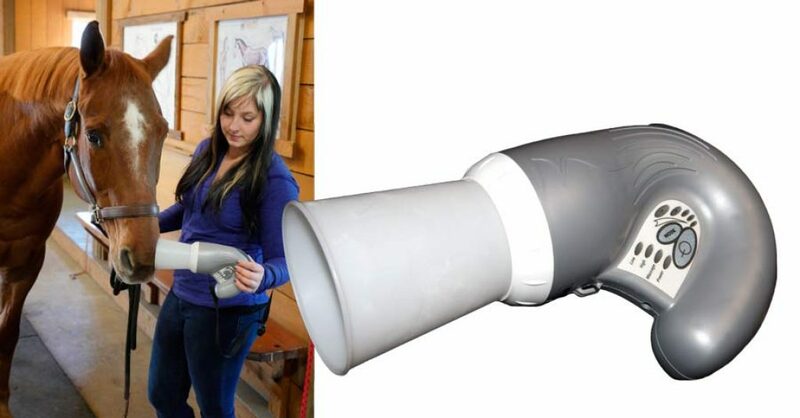 In technical terms, it is an acoustic airway clearance device. The VibraVM uses audible sound and a mix of frequencies to break up mucous collected in the lungs. It also has a massage mode that acts as a natural bronchodilator, which promotes the opening of the airway passages. The small handheld VibraVM has several different detachable applicators. 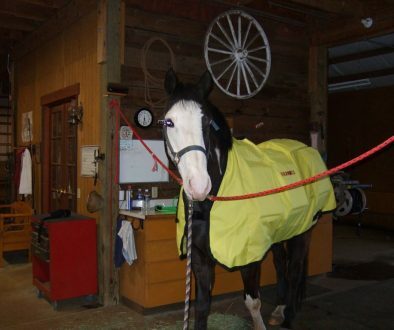 For horses, the primary applicator is the Open Nose Applicator. This accessory has an open end, which is placed over one of the horse’s nostrils. The treatment session takes about 10 minutes, with the first introduction being longer in order to acclimate the horse to the noise of the unit. This can be a similar process to getting a horse used to clippers for the first time. The VibraVM can be used to treat chronic obstructive pulmonary disease (COPD) in horses, which can be emphysema, chronic bronchitis, or even both. Recurrent airway obstruction (ROA), often referred to as asthma for horses, can also benefit from treatments with the VibraVM. ROA is an allergic respiratory disease with horses having chronic cough and nasal discharge, known as heaves and broken wind. For horses classified as bleeders, meaning they have exercised induced pulmonary hemorrhage (EIPH), the VibraVM device has been reported to help dislodge old blood collected in the lungs for maximum oxygenation. Another use for the VibraVM is for horses that could benefit from better oxygen utilization, such as clearing the lungs of irritants in horses that work and live in dusty environments. The VibraVM has also been used to clear up acute conditions, such as pneumonia and influenza. In addition to treating horses, the VibraVM can be used to help cows, calves, goats, sheep, dogs, cats, or any other mammal with acute and chronic respiratory conditions.